The new Chevrolet Aveo RS concept debuting at the Detroit auto show reveals that GM has something smart and small in the works ready to meet Ford’s much-ballyhooed new Fiesta subcompact. Larger than the current Aveo and donning what Chevy calls a “European hot-hatch look,” the five-door “Borocay Blue” RS show car is intended to appeal to the youth market—or any market, really. It previews the production version of the next Aveo due as a 2011 or 2012 model. Raise the concept’s chin a tad, tone down the chrome-rimmed outer air inlets, and replace those aluminum-wrapped exposed headlights (circumscribed as they are in blue) with similar halogen units, and you’re staring into the face of the 2011 Aveo. De-flare the RS concept’s fenders and replace the 19-inch wheels with more feasible rollers and you get a good idea of what the rest of the car will look like—we’ve seen the production-ready base model, so we should know. There’s a sedan, too, although it’s more homely than the hatch. Of course, if Chevy ends up putting out an actual Aveo RS model with body mods like those seen here, we’re fine with that. More hints about the next-gen car can be found in the Aveo RS’s leather-wrapped interior, a more spacious and rather highly designed piece of work. Production elements include the motorcycle-inspired, asymmetrical instrument cluster affixed to the column, as well as the prominent center stack. Blue stitching and other accents that match the exterior are sprinkled throughout the concept’s cabin, portending some probable interior color treatments in the next Aveo. The materials in the show car are quite nice. Indeed, given the popularity of premium hatchbacks in Europe and Japan, we could see a high-spec RS trim such as this going into production for other markets, although the fact that GM is showing it at Detroit indicates that it’s being considered for the U.S., too. 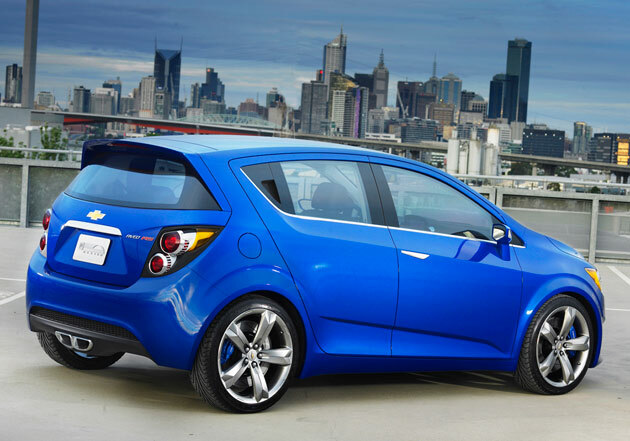 But cash-strapped GM may not be prioritizing super-high-output versions of cars like the Aveo in the near future. The Aveo RS concept is motivated by the 138-hp, 1.4-liter turbocharged Ecotec four-cylinder slated to appear soon in the Chevrolet Cruze, in this case mated to a six-speed manual transmission. It’s likely that the base production Aveo will get a less powerful, naturally aspirated four. An actual RS model is probably a ways down the pike. Chevy isn’t being specific about exactly when it will start building the next Aveo, which will happen at GM’s plant in Orion Township, Michigan. Retooling for the plant doesn’t start until late this year, so don’t expect Aveos to start hitting dealerships until next calendar year.